MOZART: Violin Concerto No. 4 in D major, KV218; VIVALDI: Concerto in A minor, Op.3 No.6 composed by Wolfgang Amadeus Mozart (1756-1791). For violin. 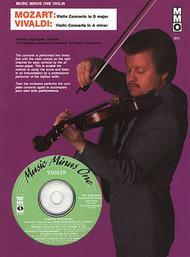 Instrumental Solo Part and CD. Published by Music Minus One (MO.MMOCD3111).ISBN 1596151404.Mozart's fourth violin concerto continues his string of magical violin masterworks, all composed in the same year. Its beautiful classical themes and orchestrations make it a magnificent piece for the violinist. Vivaldi's A minor violin concerto is a baroque masterpiece. A marvelous piece not to be passed over!Contains a printed solo part and a compact disc featuring both concerti in split-channel stereo with the violinist on the right channel; then again in a stereo accompaniment version minus the solo violin part.